Vanessa's Card Studio: Thanks so much! 1. I am a southern girl who now lives in Oregon! As I looked outside at the snow today, I was excited, but also found myself longing for the tropical temperatures of Florida. 2. I am married to a wonderful man named Scott who was born in China. I'm still learning about his culture and frankly, he's still trying to understand the things I do. I love that he understands my need to keep our kitchen table piled high with crafting projects. 3. I love animals. As a child I was surrounded by horses and dogs and learned to love all furry things. My mother said the only time I really had a tantrum in public was when she suggested it was time for me to leave the petting zoo. I evidently caused a scene that she still thinks of often. And while I no longer have horses or cats, I do currently have an Australian shepherd named Baron. 4. I love to travel and my husband does not. It works out well because I get to travel with my mother. We have a great time on our mother-daughter excursions! 7. I am a simple girl. I'm happy with just one or two pieces of jewelry, I don't regularly do my nails or go to spas. I do, however, love chunky highlights in my hair and Vera Bradley bags. 8. I like a wide range of music. I have programmed my Jango.com channel so it plays a mixture of Contemporary Christian, Top 40, Punk, Hard Rock, Classical and Oldies. It makes me happy. 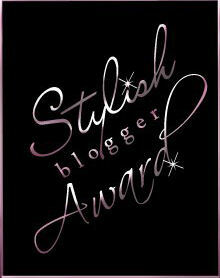 So now that you know pretty much everything about me, I'd like to award the following blogs the Stylish Blogger Award. Enjoy the inspiration! Paula loves the blossom petals punch too. Elin makes some of the coolest ornaments. I love Kimberly's vintage and artistic style. Anyone who can make a bow maker out of a fork gets my vote! Renee is just like me and puts ribbon on everything! I love Sage's sense of style. Lee has such variety in her styles... bright and fun one day and vintage the next. Krista's clean styles inspire me. thanks for the award Vanessa! Congrats! I followed from the Stampin' Connection Thread and now following your blog! Please follow mine. Thanks! !